ALL-ITEMS: During the month of October 2017 the All-Items Consumer Price Index (CPI) stood at 104.6, an increase from the CPI of 103.6 recorded in October of 2016 (See Figure 1). This means that the average Belizean Household experienced a 0.9 percent increase in the cost of regularly purchased goods and services when compared to October of last year. For the first nine months of 2017, a year-to-date inflation rate of 1.2 percent was recorded. TRANSPORT: Going into the fourth quarter of 2017, the ‘Transport’ index, up 7.8 percent remained the main contributor to rising consumer prices. Within the sub-category of ‘Fuels and Lubricants’ an 8.7 percent increase was recorded, as all fuel types experienced higher prices in comparison to October of last year. The price per gallon of Premium gasoline rose by 18 percent from $10.13 in October 2016 to $11.95 in October 2017, while Regular gasoline rose 11.9 percent from $9.32 per gallon to $10.44 per gallon, and the price per gallon of Diesel was up 13.2 percent from $8.53 to $9.65 (See Table 1). Higher international airfares along with last year’s increase in domestic bus fares also contributed to the overall rise in Transport costs during the month. FOOD & NON-ALCOHOLIC BEVERAGES and ALCOHOLIC BEVERAGES & TOBACCO: A decline in the prices of several ‘Food’ items resulted in a 0.8 percent overall decrease in the ‘Food and Non- Alcoholic Beverages’ category (See Figure 2). Various meat products, including ground beef, beef steak, pig tail, and whole chicken, along with other food items such as eggs and milk recorded slight price decreases for the month (See Table1). ‘Alcoholic Beverages and Tobacco’, on the other hand saw a 6.3 percent increase in October of 2017, reflecting the increase in excise taxes earlier in the year, which resulted in an increase in the cost of beer compared to the same month last year. HOUSING, WATER, ELECTRICITY, GAS & OTHER FUELS: Home rental costs were up slightly by 0.4 percent in comparison to last October, while Liquefied Petroleum Gas (LPG) recorded a 14.9 percent price increase as the average cost of a 100-pound cylinder of LPG rose from $86.61 in October 2016 to $99.51 in October 2017 (See Table 1). 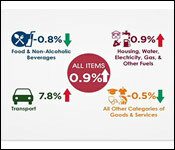 As a result, an overall 0.9 percent rise in the ‘Housing, Water, Electricity, Gas and Other Fuels’ category was recorded. INFLATION BY MUNICIPALITY: During the month of October 2017, the trend observed during the previous months continued, with households in Dangriga experiencing the nation’s highest increase in consumer prices at 2.4 percent, due to a higher than average rise in home rental costs. Orange Walk Town was the only municipality recording lower consumer prices during the month, with an inflation rate of negative 0.3 percent, while Belmopan City had the second lowest inflation rate at 0.1 percent. (see Figure 3). Click here for the whole report! OCTOBER 2017:For the month of October 2017, Belize imported goods valuing $168.8 million. This represented a 14 percent or $20.7 million increase from the same month in 2016, when imports totalled just over $148 million. Sizeable increases across five categories led to the first significant growth in monthly imports since the start of the year. Greater imports of goods destined for the ‘Commercial Free Zones’ and higher food purchases together contributed over a half of the increase seen during the month of October. Heightened spending on clothing, cigarettes and handbags drove imports into the ‘Commercial Free Zones’ up by 23 percent or $5.9 million, from $25.7 million in October of 2016 to $31.6 million in the same month of 2017. The ‘Food and Live Animals’ category rose by one third or $5.2 million, from $15.5 million to $20.7 million, due to a spike in wheat seed imports. Imported manufactured goods went up by over 21 percent during the month, from $20.1 million in October 2016 to $24.4 million in October 2017, as the country purchased more carton boxes, aluminium/zinc coils and steel rods. The ‘Mineral Fuels and Lubricants’ category, which also grew by 21 percent, increased from $14.4 million to $17.5 million, primarily due to higher world market prices for regular fuel and greater quantities of imported butane compared to last October. Additionally, a surge in cigarette imports for the month of October resulted in an increase in the ‘Beverages and Tobacco’ category, from $1.9 million in 2016 to $3.2 million in 2017. FIRST TEN MONTHS OF THE YEAR: Merchandise imports for the ten months January to October 2017 amounted $1.5 billion, representing a 4.1 percent or $64.6 million drop from the same period last year. ‘Machinery and Transport Equipment’ was the category which saw the greatest decline over the ten-month period, falling by more than 20 percent or $80 million, from $385 million in 2016 to $305 million in 2017, with imports of telecommunication parts and four cylinder vehicles showing considerable decreases within that category. The categories of ‘Other Manufactures’, ‘Food and Live Animals’ and ‘Export Processing Zones’ also dropped markedly over the January to October period. Imports within the ‘Other Manufactures’ category went down by $11 million, from $147 million in 2016 to $136 million in 2017, on account of reduced purchases of prefabricated buildings and plastic bottles, while Belize’s food import bill was also down by about $11 million, from $190 million to $179 million, due to decreases in goods such as soybean meal, lard (shortening) and coffee. Goods meant for the ‘Export Processing Zones’ declined 22 percent or almost $9 million over the period, from $40 million in 2016 to $31 million in 2017, as a result of fewer imports of gaming machines and their parts as well as the fact that no wood planer machines were purchased for the 2017 period. ‘Mineral Fuels and Lubricants’, on the other hand, saw a substantial 19 percent or $29 million increase, from $152 million in 2016 to $181 million in 2017, as more was spent on imports of all types of fuels during the period. The remaining categories, ‘Chemical Products’, ‘Manufactured Goods’ and ‘Oils and Fats’, went up by a combined $17.7 million over the period. OCTOBER 2017: The total value of Belize’s domestic exports for the month of October 2017 was $37.1 million, up 66.4 percent or $14.8 million from the $22.3 million recorded for October 2016. For the month of October 2017, bananas were the top earners among all exported goods. Sales for that commodity totalled $8.9 million during the month, more than double the $4.2 million recorded for October 2016. 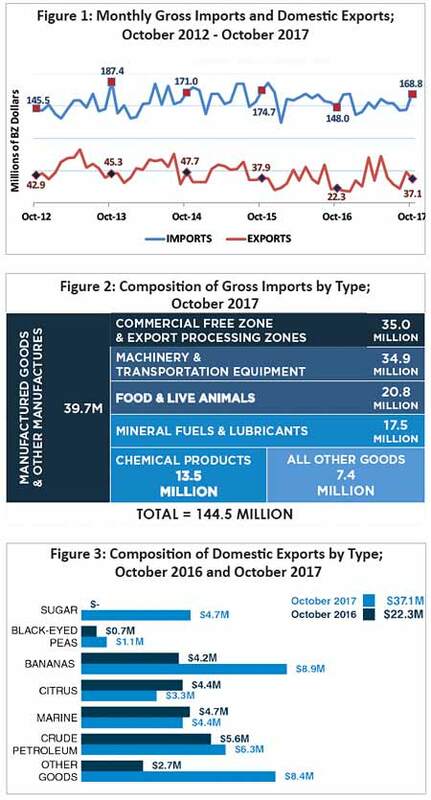 Exports of sugar amounted to $4.7 million in October 2017, in contrast to the same month in 2016 when no shipments of this commodity were recorded, further contributing to the overall increase in domestic export earnings. Belize’s crude petroleum exports continued to benefit from favourable world market prices, with revenues up slightly by $0.7 million, from $5.6 million in 2016 to $6.3 million in 2017, despite there being virtually no difference in exported volumes compared to the same month of last year. In contrast, exports of marine products fell slightly, from $4.7 million to $4.4 million during the month, largely due to a drop in conch sales from $2.7 million in October 2016 to $1.3 million in October 2017. Citrus sales also declined considerably, falling by $1.1 million from $4.4 million to $3.3 million, owing mostly to a plunge in exports of grapefruit concentrate during the month. As a consequence of the strong sales of bananas and sugar for the month of October 2017, exports to the United Kingdom, the rest of the European Union and the United States, all increased considerably when compared to October 2016. Exports to the United Kingdom more than tripled, growing from $3.6 million in last October to $11.4 million in October 2017 due to increased exports of both commodities, while revenues from the rest of the European Union rose by almost 60 percent, from $2.2 million to $3.5 million, due largely to the spike in banana sales. In October 2017, exports to the United States of America stood at $9.6 million, up $5.7 million over the $3.9 million noted for that same month last year, the result of boosted sugar sales to the country. FIRST TEN MONTHS OF THE YEAR: Merchandise exports for the period January to October 2017 totalled $413 million, up 13.2 percent or $48.1 million from the $364.9 million recorded during same period last year. Belize’s leading export commodity, sugar, was the principal driver of the substantial growth in overall domestic exports, accounting for almost 35 percent of total export earnings over the period. For the ten months from January to October, sales from that commodity rose significantly from $102.5 million in 2016 to nearly $143 million in 2017, a revenue increase of 39.5 percent or $40.5 million. In addition, bananas performed strongly over the period, as sales of that product grew by 16.7 percent or $10.1 million, from $60.4 million in 2016 to $70.5 million in 2017. Sales of marine products, however, saw only minimal improvement, rising by just over $1 million from $30.6 million to $31.7 million as a result of higher revenues from lobster tail exports. Despite a 20 percent drop in exported volumes compared to the same period in 2016, earnings from crude petroleum remained almost unchanged, as prices for that export continued to be favourable on the world market. On the other hand, the country’s second largest export earner, citrus products, fell by 19.2 percent, from $93.1 million to $75.2 million, largely owing to diminished orange concentrate sales. ECONOMY GROWS 0.5% IN THIRD QUARTER 2017: TERTIARY ACTIVITIES UP, PRIMARY AND SECONDARY ACTIVITIES DOWN. Preliminary estimates by the Statistical Institute of Belize indicate that, for the three months from July to September 2017, the country’s level of economic activity increased by 0.5 percent when compared to the same period in 2016. The total value of goods and services produced in Belize was $662.5 million, up $3.4 million from $659.1 million in the third quarter of 2016 (see Figure 1). For the first nine months of the year, the country’s level of production was also 0.5 percent higher than in 2016. PRIMARY ACTIVITIES: The primary sector, which accounts for almost 10 percent of the country’s economic activity, experienced a decline of 2.2 percent during the third quarter when compared to the same period in 2016. Marine exports fell by 16.4 percent, contributing significantly to a 15 percent decline in the “Fishing” sector, as the shrimp industry continues to struggle towards recovery. Banana shipments dropped by 4 percent, from 24 thousand metric tons to 23 thousand metric tons, as the industry continues to recover from the effects of Hurricane Earl in 2016. These declines were partially offset by an 8 percent increase in the livestock industry, as cattle production rose by 15.9 percent while poultry production was up by 7.1 percent compared to the third quarter of 2016. SECONDARY ACTIVITIES: Secondary activities recorded an overall decrease of 4 percent in the third quarter of 2017. The “Electricity and Water” sector saw a decline of 2.1 percent, due to a 3.1 percent decrease in electricity generation when compared to the same period of 2016. This was as a result of decreased hydroelectric generation during the quarter, in response to a reduction in demand. Water distribution, on the other hand, recorded an increase of 4.4 percent due to an increase in household demand during the summer months. “Manufacturing and Mining” activities declined by 12.6 percent, largely due a 17.5 percent reduction in beverage production during the quarter. Beer production was down by 8.3 percent compared to the same quarter of 2016, due to an increase in excise tax and, by extension, the price of beer, while soft drink production dropped by 28.8 percent, corresponding to an increase in soft drink imports. Crude petroleum extraction fell by 20.4 percent due to the continued natural depletion of reservoirs. On the other hand, construction activities saw an increase of 4 percent, owing to ongoing works on infrastructural development and private construction, as evidenced by a 20.5 percent growth in the importation of cement during the quarter. This was also reflected in an increase in the number of building plans approved by the Central Building Authority. TERTIARY ACTIVITIES: The tertiary sector, which accounts for more than half of Belize’s total economy, grew by 2.6 percent during the third quarter of 2017 when compared to the same period in 2016. “Wholesale and Retail Trade” was up by 2.9 percent, while “Transport, Storage and Communication” increased by the same percentage, as a result of an increase in freight. “Accommodation and Food Services” recorded an increase of 0.9 percent as the number of overnight visitors rose by 10.9 percent and cruise passenger increased by 6.1 percent during the quarter. 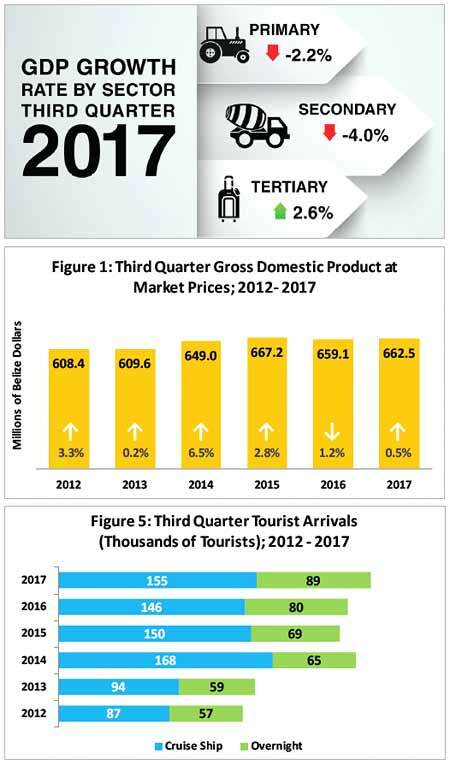 It should be noted that, notwithstanding the growing numbers of tourists visiting the country, hotel room revenues were down in comparison to the third quarter of 2016, indicative of the trend towards lower cost vacation rentals as opposed to traditional hotels and resorts. Moving on to the Consumer Price Index - based on the statistics, food prices have gone down for this 3rd quarter while rent and of course, transportation has driven the inflation rate up. 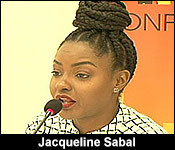 Statistician Jacqueline Sabal tells us more. 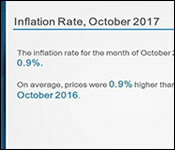 "The Inflation Rate for the month of October 2017 stood at 0.9 percent, meaning that on average prices were 0.9 percent higher than they were in October 2016. If we look at the major categories affecting the inflation rate then we must consider the food and non-alcoholic beverages category which decrease by 0.8 percent. The housing water, electricity, gas and other fuels category which recorded a 0.9 percent increase as well as transport which increase by 7.8 percent." "When compare to October 2016, the 0.8 percent decrease in the food and non-alcohol beverages category was solely due to a decline in food prices. Certain meat prices fell as well as the cost of eggs, milk, and some fruits and vegetables. The price per pound for ground beef fell 9.7 percent from 6 dollars and 27 cents to 5 and 66 cents. Beef steak fell 6.3 percent from 8 dollars and 14 cents to 7 dollars and 63 cents. The cost of a dozen eggs fell 4.7 percent from 3 dollars and 32 cents to 3 dollars and 16 cents. The cost of a liter of milk fell 12.5 percent from 2 dollars and 69 cents to 2 dollars and 36 cents. The price per pound for lettuce also fell 17.2 percent from 2 dollars and 78 cents to 2 dollars and 30 cents along with tomatoes which fell 15.9 percent from 2 and 78 cents to 2 dollars 34 cents." "Next in the housing, water, electricity, gas and other fuels categories there was an overall 0.9 percent increase. This was nearly due to a 0.4 percent increase in home rental prices. Now we look at the transport index and what causes the increase in that. Since the start of the year, the start of the transport index has been one of the main contributors to the overall rise in the inflation rate and this was mainly due to fluctuations in the fuel and lubricant category. For the most part, lubricant index look almost identical to the overall transport index which means its impact was pretty large as fuel especially has been rising significantly in 2017 compared to 2016." In terms of the inflation rate by municipality, Dangriga Town documented the highest with a 2.4% increase in October 2017 while Orange Walk town documented a -0.3% decrease. That means that things are cheaper up North than they are down South. We will have more from the SIB press conference tomorrow - one element that was not covered was the September 2017 Labour Force Survey which gives us the unemployment rate. In a release sent out by SIB it states "due to an unforeseen setback â€¦ the findings of the LFS will be published instead on the next SIB press release date on Wednesday, December 27th. The Statistical Institute has released the economic figures for the 3rd quarter - that is, from July to September. There has been very minimal growth. We start off with the Gross Domestic Product. For this period, there has been a marginal 0.5% growth compared to the same period last year which documented a 1.2% decrease. Here is Statistician Angelita Campbell with the breakdown. Now that slight increase in GDP has to do with good performance in the tertiary industries including tourism, transportation, communication among other categories. But the same can't be said for the primary and secondary sectors. there were notable decreases in both. For the primary sector, there was a major decline in fishing while in the secondary industry - the production of beverages including beers and softdrinks declined. Here are more details. Regarding the secondary sector, the decrease in production of soft drinks is due to the importation of soft drinks. And just to note, in the tertiary industry although there are a significant number of cruise passengers there is a decrease in hotel room earnings because more tourists are staying at cheaper hotels and booking on sites like AirBandB.